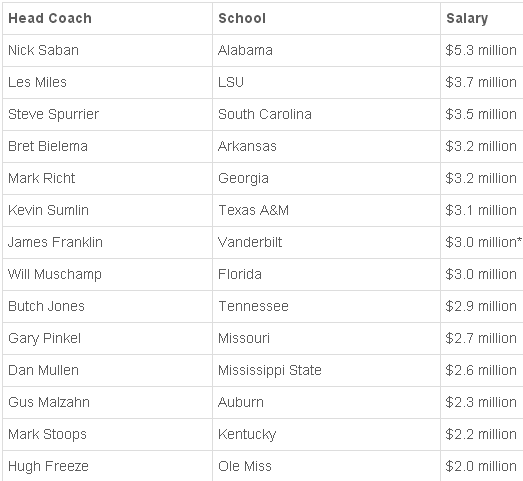 Ole Miss seems to be getting the most value for what they are paying considering the job Hugh Freeze has done. One could also argue that Kentucky is getting great value as well considering how well Mark Stoops has done on the recruiting trail. In terms of “least value,” I would argue that Arkansas is over-paying for Bret Bielema. He is the fourth highest paid coach in the league, and had better start producing wins right away to justify that pay check. The following salaries are as of July 26, 2013. *Franklin’s $3 million is estimated due to the fact that Vanderbilt is a private school. This entry was posted in 2013, SEC by Travis Normand. Bookmark the permalink. Guess who is in the wrong profession…THIS GUY!! !